I have a confession to make. I love crunchy, salty snacks. And while I am a big believer in ‘everything in moderation’, I find it very hard to moderate my salty snack intake. This is especially true at around 4pm every afternoon when my energy is low and I crave nothing but crunchy carbohydrates. Unfortunately, eating snacks made up entirely of carbohydrates never keeps me satisfied until dinner. So I have been looking for a healthy alternative. Something crunchy and savory, but with protein and fiber to keep me feeling full. 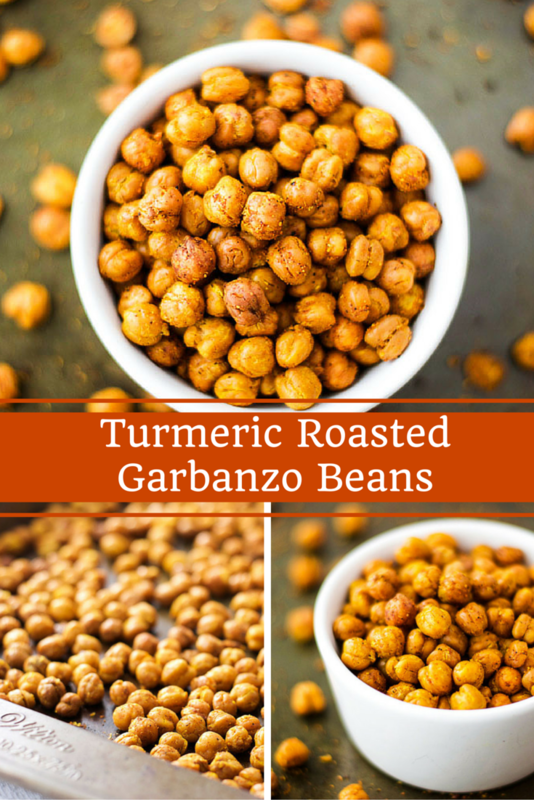 That is what inspired this recipe for turmeric roasted garbanzo beans (chickpeas). Garbanzo beans are a wonderfully healthy legume. 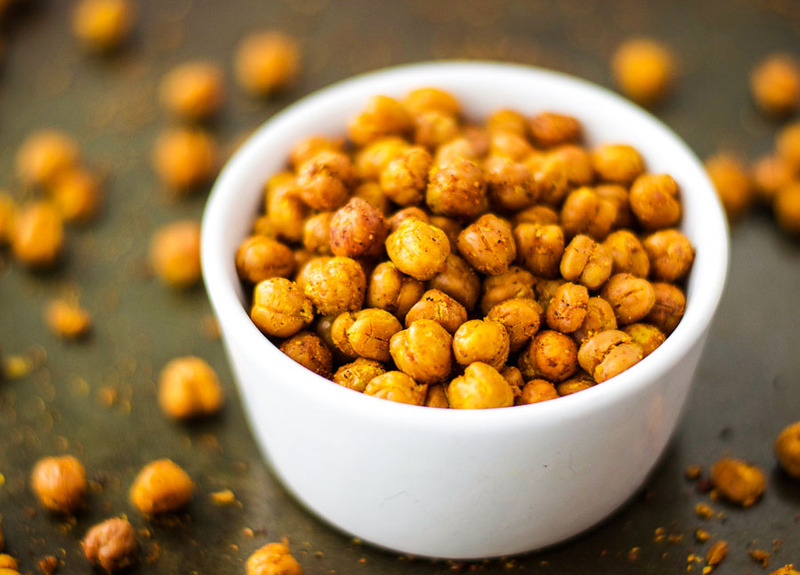 Half a cup of these little beauties contains only 135 calories, but a whopping 6 grams of fiber (that’s 1/4 of a woman’s daily fiber needs) and 7 grams of protein. That same half cup has only 2 grams of fat, most of which is the heart-healthy polyunsaturated kind. Their nutritional profile is perfect for a healthy afternoon snack – low calorie, low fat, high fiber, with some carbohydrate and a good amount of protein. But I decided to take them to the next level by adding turmeric. As I’m sure you have heard me say before, turmeric has excellent anti-inflammatory and antioxidant properties. It’s no wonder people are dubbing it the ‘superfood of the year.’ I also added some black pepper, because that increases the body’s ability to absorb the curcumin (the beneficial compound in the turmeric). You must remove the skins from the garbanzo beans. I know it sounds like a tedious job, but please believe me when I tell you it makes all the difference. The skins hold a lot of moisture. If you don’t remove them, you end up with a chewy, unsatisfying snack. If you do remove them, the garbanzo beans end up perfectly crispy. I promise it is worth the effort. And if you are anything like me, it will become a somewhat mesmerizing job. Just put the rinsed beans in a clean kitchen towel, rub them slightly, and remove the loose skins. Keep doing that until all the garbanzo beans are naked. Do not add the spices until part way through the cooking process. If you add them too early, they have a tendency to burn. By adding them at the end, you can leave the beans in long enough to go crispy without burning your spices. 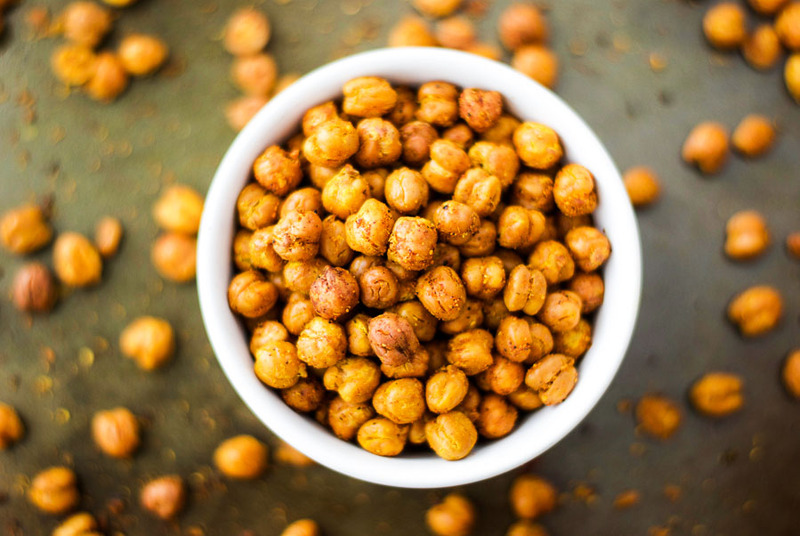 So if you are looking to satisfy your salty snack craving with a healthy fiber and protein-rich option, look no further than this recipe for turmeric roasted garbanzo beans. They are even a big hit with my 5-year old, making them a great alternative to processed goldfish crackers. 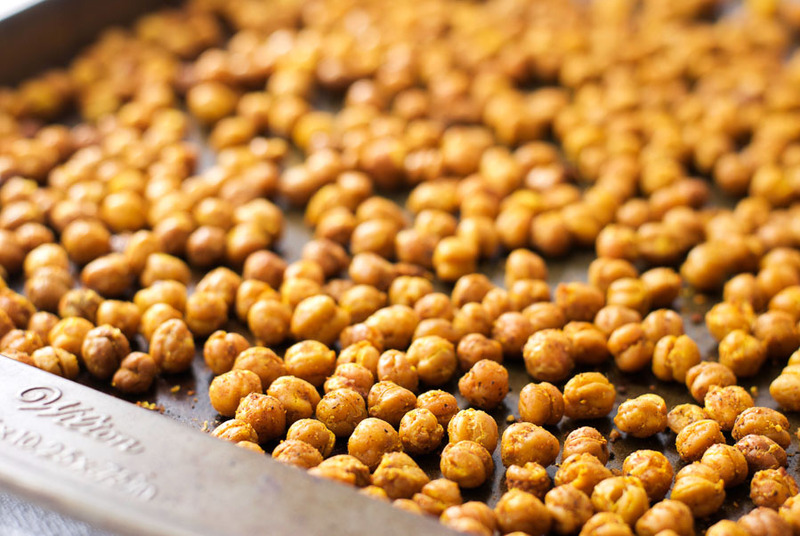 Put the garbanzo beans on a clean kitchen towel and rub gently to remove the skins. Keep rubbing and removing the skins until all the beans are naked. The more skins you remove, the crunchier your garbanzo beans will be. Put the garbanzo beans in a large bowl, add the olive oil and salt, and mix well. Spread the garbanzo beans evenly on the lined baking tray. Cook for 20 minutes, shaking half way through to ensure even cooking. Meanwhile, put the turmeric, curry powder, garlic powder, and black pepper (and cayenne if you like heat) in a small bowl and stir to combine. Remove the garbanzo beans from the oven. Sprinkle the spice mix on the garbanzo beans and toss to coat all the beans (add an extra drizzle of olive oil if the spices won’t stick). Return to the oven for a further 15-18 minutes, until crispy. Remove from the oven, leave to cool completely, then enjoy. Can be stored in an airtight container, but make sure they are completely cool before closing the lid. Thank you for your comment Evi. I’m so glad I could inspire you to revisit a recipe. I love it when someone reminds me of something I haven’t made in a while. These look so good! I’ve heard that removing the skins of garbazo beans helps – I will have to try it. Thanks Anne. I was surprised at just how much of a difference it made when I removed the skins. The garbanzo beans came out even more crispy than the ones I had previously bought at Whole Foods. I’d love to hear how yours turn out if you make them. I am always on the lookout for healthy snacks! Can’t wait to try this recipe! Hi, This recipe looks great! If I am starting out with dry, uncooked garbanzo beans, how many cups would I need to make this recipe? Thanks!